Cloud-based services allow our clients to leverage the benefits of cloud computing today until all concerns e.g. 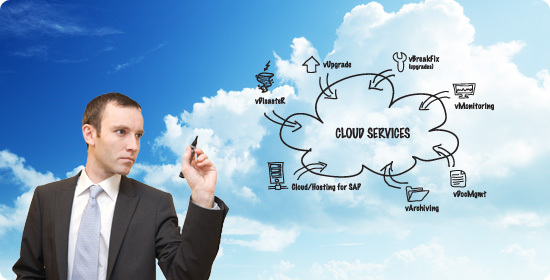 security, regulations, compliance etc of operating a productive SAP environment in a cloud environment are resolved. Cloud-based services are "plug-in services" and are based on the concept of service oriented architecture. Our services can easily be plugged-in with an existing on-premise SAP production environment and fully leverage the value proposition of Cloud Computing. Cloud Computing is liberating IT departments from their present-day costly and complicated information architectures and infrastructures. Instead of purchasing, running, maintaining and disposing of a staggeringly high number of hardware components each year, businesses will consume software, hardware and network services on an as-needed basis, paying for only the resources (logical and physical) they use. Our cloud services are based on the delivery model of Software-as-a-Service (SaaS). This enables SAP applications to exist in the cloud and deliver functionality directly to an internet browser or SAP GUI. Cloud-based services e.g. for monitoring a SAP landscape can be easily plugged-in with an existing on-premise SAP production environment. With SaaS as a service delivery model, there is no need for IT departments to purchase, support and maintain expensive applications and supporting technical firmament.